SAN DIEGO - The U.S.-Mexico border is one of the world's most fortified international divides. Starting Wednesday, it will also be one of the world's only boundaries with an airport straddling two countries. An investor group that includes Chicago billionaire Sam Zell built a sleek terminal in San Diego with a bridge that crosses a razor-wire border fence to Tijuana's decades-old airport. Passengers pay $18 to walk a 390-foot overpass to Tijuana International Airport, a springboard to about 30 Mexican destinations. The terminal is targeting the estimated 60 percent of Tijuana airport passengers who cross into the United States, about 2.6 million travelers last year. Now, they drive about 15 minutes to a congested land crossing, where they sometimes wait several hours to enter San Diego by car or on foot. The airport bridge is a five-minute walk to a U.S. border inspector. "This is going to be a real boon to South County and certainly a success for the San Diego region," said San Diego County Supervisor Greg Cox. "It seems so much easier, so liberating," said Daniela Calderon, who flies from Tijuana four times a year to visit family in the central Mexican city of Morelia and has a friend drive her across the border from Riverside, California. The only other cross-border airport known to industry experts is in the European Union -- between Basel, Switzerland, and France's Upper Rhine region -- but it carries none of the political freight of San Diego and Tijuana. Mexicans who ran across the border illegally overwhelmed the Border Patrol until the mid-1990s, when new fences and additional agents heralded a massive surge in U.S. enforcement on the 1,954-mile line with Mexico. Cross Border Xpress, one of the largest privately-operated U.S. air terminals, wouldn't have happened if Tijuana didn't build its airport a few steps from the international line in the 1950s or if it wasn't surrounded by undeveloped land in a barren, industrial part of San Diego. "It's an amazing accident of geography," said Stanis Smith of Stantec Inc., the terminal's architect. "It could never happen again." "It wasn't easy, but you know it hasn't been done anywhere else on the planet," said Cross Border Xpress Chief Commercial Officer Elizabeth Brown. "This is incredibly exciting." The terminal is one of the last works by the late Ricardo Legorreta, whose bold colors helped bring Mexican modernism to a world stage and attracted a strong following in the American Southwest. The stone exterior mixes purple stucco and red limestone that takes on a deep, inky hue when it rains. Stone gardens sprout agave and other desert plants. Passengers enter a courtyard with a reflecting pool to an airy building with ticket counters and kiosks. High, white ceilings have large orange circles of recessed lighting. Sparse decorative touches are onyx, including high-hanging black slabs near ticket counters and white spheres atop the escalators. Aesthetics are more dated in the Tijuana airport but passenger flow is the same. Ticketed passengers must carry luggage across a bridge with frosted glass windows to border inspectors in the receiving country and a wall in the middle to separate the two directions. "The model can absolutely be replicate, but I'm not sure how many other places in the world actually have an international airport sitting on a major international border with the United States," said Brown. The idea isn't new -- San Diego leaders proposed an airport with a runway on each side of the border in the early 1990s to replace the city's constrained Lindbergh Field -- but it didn't gain traction until a Mexican couple invested in 2005 in a company that runs airports in Tijuana and 11 other Mexican cities. Carlos Laviada, whose mother-in-law lived in San Diego, had experienced the hassles of crossing the border after flying to Tijuana for decades. The view of San Diego from Tijuana's control tower convinced him he had to act before the vacant land was developed. "Oh, my God, it's right here," he recalls saying. Laviada said Grupo Aeroportuario del Pacifico SAB's board deemed it too risky but allowed him, his wife and another company director to invest privately. Zell and another Mexican investor joined them. The privately-held consortium, Otay-Tijuana Venture LLC, doesn't release financial projections but expects to make money on a duty-free shop, rental car companies, restaurants and other concessions. The $120 million terminal occupies less than half their 55-acre parcel, and the city of San Diego has approved a 340-room hotel, shopping center and gas station. 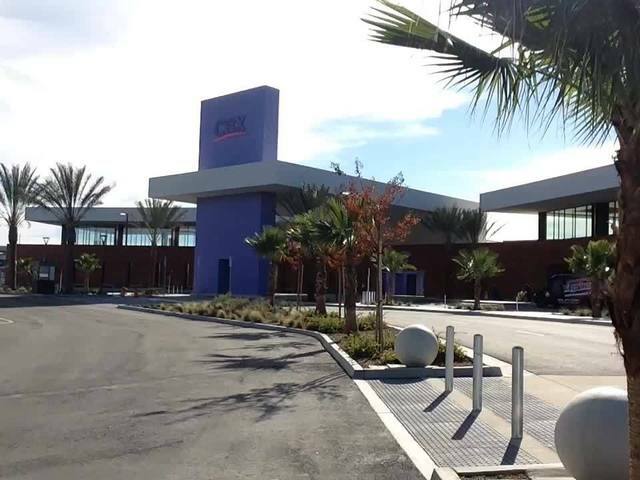 Parking costs $10 a day, which is competitive with lots near land crossings and Tijuana's airport. The terminal fee will go largely to pay U.S. border inspector salaries, one of the nation's few privately funded ports of entry. Laviada, echoing views of airport officials on both sides of the border, doesn't consider Tijuana a threat to San Diego's airport because they share few routes. Both are primarily domestic airports, and Tijuana has shown no sign of expanding international destinations beyond Shanghai and Oakland, California. Cross Border Xpress officials say they hope to capture half of Tijuana passengers bound for the U.S., which sounds realistic to nervous Tijuana airport taxi drivers who charge $13 for a ride to a land crossing. Nearly all cars in the Tijuana airport garage have California plates. Passengers joke that they spend more time crossing the border than they do on the plane. "No more driving around so much," Maria de Jesus Gonzalez said after arriving in Tijuana from a family visit to Guadalajara and waiting for her son to drive from Southern California. "This will be much more direct." "We have U.S. Customs and Border Protection here protecting the border in the same ways they protect in Otay Mesa and in San Ysidro," said Brown. "[It's] probably more secure because this has been designed from the ground up with security in mind," added Cox. Tijuana International Airport also offers direct flights to destinations you can't get through San Diego's Lindbergh Field, with some of those flights being less expensive. 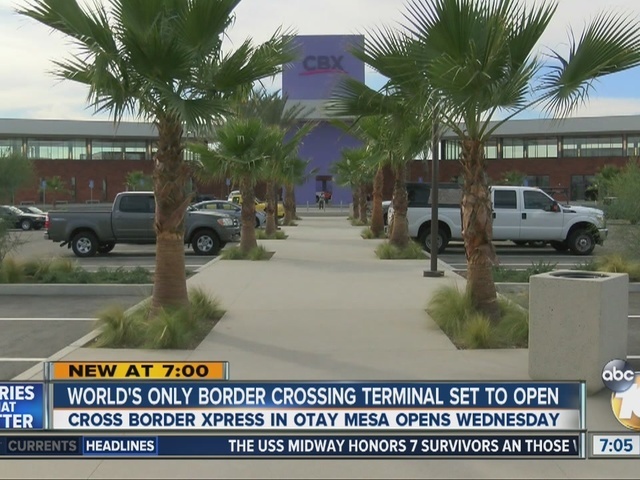 The CBX also allows travelers to avoid the long traffic wait times at the regular border crossings.